Are you growing your business? Adding new products or services? New locations? Adding partners or owners? If so, these are all instances when you should consider setting up a subsidiary or other new entity for your existing company. While you can run multiple streams of business through one entity, there are tax, asset protection, and partnership reasons why you may want to open up a new subsidiary entity for your new activity. You may want a new entity to separate and differentiate services or products for liability purposes. For example, let’s say you are a real estate broker providing services of buying and selling properties and you decide to start providing property management services. Because the property management service entails more liability risk, a new entity owned wholly by your existing business could be utilized. The benefit of the new subsidiary is that if anything occurs in the new property management business, then that liability is contained in the new subsidiary and does not go down and affect your existing purchase and sale business. On the other hand, if you ran the property management services directly from the existing company without a new subsidiary and a liability arose, then your purchase and sale business that is running through the same entity would be effected and subject to the liability. For tax purposes, in this instance, the income from the new subsidiary entity (child) will flow down to the parent entity without a federal tax return, and as a result, there is no benefit or disadvantage from a tax planning standpoint. What if you’re establishing a new retail or office location for your business? Let’s say you are a restaurant opening up your second location. For asset protection purposes, you should consider setting up a second entity for the new location. This can limit your risk on the lease (don’t sign a personal guarantee) for the new location or for any liability that may occur at the new location. In this instance, if one location fails or has liability, it won’t affect the other location as they are held in separate entities. The saying goes, “don’t put all your eggs in one basket.” In this case, the basket is the same entity and the locations are your eggs. 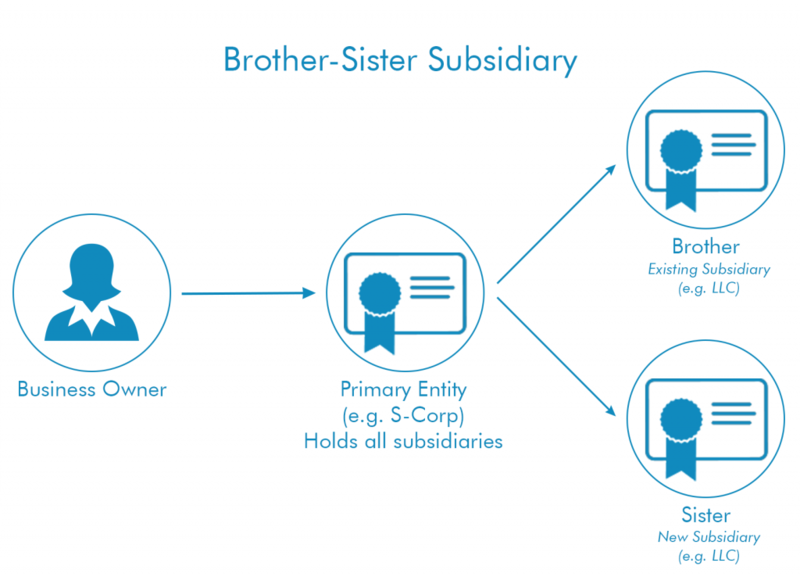 In the multiple location scenario, you should consider the brother-sister subsidiary structure such that each location is owned in a brother-sister relationship (e.g. neither owns the other) and their common connection is simply the underlying company (or person) who owns each entity for each location. Because both locations have risk it is useful for each to have their own entity and not to own each other (as can occur in the parent-child subsidiary). When structured in a brother-sister relationship, the liability for each location is contained in each subsidiary entity and cannot run over into the other subsidiary entity (the sibling entity) or down to the owner (which may be you personally or your operational holding company). Maybe you’re starting a new business or operation where you have a new partner involved. If this partner isn’t involved in your other business activities or your existing company, it is critical that a new entity be established to operate the new partnership business. If you have an existing entity where you run business operational income (e.g., an S-Corporation), then this entity may own your share of the new partnership entity (e.g., an LLC) with your new partner. Your share of the new partnership income flows through the partnership to your existing business entity where you will recognize the income and pay yourself. In this instance, your existing entity is the parent and the new partnership is a partial-child subsidiary. The new partnership entity will typically file a partnership tax return. Because of gross receipts taxes in California, you may use a Q-Sub entity model where the subsidiary entity is actually another S-Corporation and is called a Q-Sub. This is available only when the parent entity is an S-Corporation and can avoid double gross receipts tax at the subsidiary and parent entity level. Make sure you speak to your tax attorney for specific planning considerations as there are asset protection and tax considerations unique to each business and subsidiary structure.